Chinese-funded projects in Laos could hasten the eradication of the elephant population. According to the Xayaboury Elephant Conservation Center (ECC), Laos’ current elephant population is estimated to be fairly evenly split between 400 wild and 450 domesticated elephants. These dwindling numbers are the latest in a consistent trend of population decline, with total numbers dropping by almost 90 percent since 1988. Reversing this downward trend for future generations is dependent on addressing four key challenges that are all likely to become more pronounced under China’s BRI. First is deforestation. At 46.7 percent of total land area, Laos remains one of the most heavily forested countries in Southeast Asia. However, forest cover has declined dramatically in recent decades – down from an estimated 70 percent of land area in the mid-1960s. For the most part, the Lao government has played an active role in driving deforestation through its aggressive pursuit of foreign investment and infrastructure-led modernization as mechanisms for “graduating” from Least Developed Country status by 2020. Large-scale agribusiness ventures, legal and illegal logging, mining projects, hydropower dams, transport infrastructures, and urbanization are all contributing forces to deforestation that are likely to accelerate under the BRI. Inter-related with deforestation is the challenge of habitat fragmentation. As road networks have expanded across Laos, natural habitats have been carved up into smaller fragments that are not sufficient for sustaining large land mammals such as elephants. Similarly, the extraction of forest resources through logging, agriculture, and other activities has also seen habitats degraded. While an “elephant-proof fence” may help to avoid collisions between elephants and the BRI high-speed rail project, it will also increase habitat fragmentation. Indeed, the disruptive effects of fences on wildlife migration and movement to access food, water, and breeding sites are well-documented across the globe. The third key threat to elephant populations is human-elephant conflict. Elephants can eat for up to 18 hours per day, consuming over 272 kilograms (600 pounds) of food. While Laos has a 4,000-year history of using elephants for farming labor, it also remains one of the poorest countries in the world, where more than 70 percent of the population are still rural agriculturalists and food security remains a persistent challenge. As elephant habitats shrink, wild populations are increasingly moving onto agricultural land in search for food, leading to a concerning number of human-elephant conflicts. As BRI infrastructure connectivity drives increasing numbers of large scale commercial agribusiness ventures, human-elephant conflict over scarce food resources is also likely to increase. Finally, there is the threat of poaching. Across Africa, 100 elephants are killed each day as a result of poaching. In Laos, where poaching rates are much lower, but not insignificant, the main threat is the flow of elephants being smuggled across the Chinese border. In the past five years, it is estimated that 80-100 elephants have been taken across the border to China (about 25 percent of the captive population), where they are sold to camps and circuses for prices as high as $250,000. While paling in comparison to transnational flows, the domestic market for ivory in Laos has also grown rapidly between 2013 and 2018. Chinese tourists are by far the largest consumers of ivory in Laos (accounting for over 80 percent of all sales), and Chinese tourist numbers are only expected to increase as new BRI infrastructures such as the Pan-Asia Railway are rolled out. Indeed, such tourism growth is one of the key economic justifications provided for the implementation of BRI projects. In November 2013 the Chinese Communist Party (CCP) announced two ambitious multibillion dollar connectivity schemes across South and Southeast Asia, Central Asia, Europe, and Africa. Now estimated to be multitrillion dollar projects, the overland (“belt”) and maritime (“road”) networks seek to use major infrastructure investments across land and sea, as well as trade and transportation agreements and people-to-people exchanges, to create new corridors of economic growth and development. Expectedly, the BRI will also increase China’s access to natural resources, build relationships to advance Chinese security interests, create new investment opportunities for Chinese firms, and tilt the global political-economy toward China’s geostrategic interests. In Southeast Asia, the BRI is constituted by maritime routes that travel through the South China Sea to the Andaman Sean (via the Straits of Malacca), and by two overland corridors: the China-Indochina Peninsular Economic Corridor (CIPEC), and the Bangladesh-China-India-Myanmar Economic Corridor. As with the BRI more broadly, these corridors are framed by China (and others) as powerful vehicles for socioeconomic development that will boost economic growth and bring improved livelihoods and wellbeing to millions of people. Such celebratory rhetoric has, however, been heavily contested. As has been demonstrated on countless occasions, the benefits of infrastructure connectivity are not evenly distributed, and in fact new opportunities often come alongside new threats and forces of social and environmental harm. Sticking just with environmental threats, extensive academic research has demonstrated that new roads and railway projects have the potential to: increase habitat loss through logging and agribusiness; reduce the reproductive capacity of sensitive species as a result of chronic transport noise; create barriers to essential animal movement; alter forest microclimates and the distribution of specialized plant and animal species; create soil erosion and increase risk of landslides; and increase human migration into forest frontiers, causing human-animal conflict, increased poaching, logging, and forest fires. As transnational infrastructures open up new opportunities for the movement of goods and people beyond borders, the poaching and trafficking of endangered species from in and beyond the region is increasing – including the establishment of new hotspots for protected wildlife consumption, such as the casino zones in Laos and Myanmar’s “Golden Triangle” borderlands. Beyond elephants, Southeast Asia is home to a higher proportion of globally threatened vascular plant, reptile, bird, and mammal species than any other region on the planet. Bear and tiger farms, as well as elephant poaching, have all benefited from BRI corridors (and other connectivity schemes), and will continue to be a persistent threats for species extinction for decades to come. Without active human intervention, Laos will have no more elephants by 2030. Indeed, with BRI road and railway construction steaming ahead, we may see the total extinction of native elephants in Laos before 2030. At present it seems that attempts to halt BRI infrastructure roll out in Laos are futile. The perceived economic growth potential is too tempting for “least developed” Laos to pass up, and there is simply too much money to be made by state and corporate cronies. Many people across the country have never seen a train, let alone a high-speed train, and there is much excitement about what the future holds. So what else can be done to combat the loss of Laos’ largest, and most revered, animal? First, each of the above four challenges requires committed responses by the Lao government and international nongovernment organizations. Legislation will be important here, as the Lao government must effectively protect its national protected areas and work with partner organizations to tackle illegal poaching and other related activities. But Laos also serves as an important reminder that legislation alone is not sufficient. To date, almost no arrests or prosecutions have been made of ivory smugglers, and the Lao government remains a 20 percent stakeholder in the country’s chief illegal wildlife trafficking hotspot at the Kings Romans Casino Special Economic Zone. In 1989 it became illegal to catch wild elephants in Laos, and in 1996 all trading in wildlife (except for the purpose of research or conservation) was banned. Yet poaching continues, in part because of the parallel challenges of weak state governance and state corruption, but also because of large legal “grey areas” – most notably that parts of domesticated elephants can still be sold. Similarly, over the past six years the Lao government has ordered a number of moratoriums and notices to suspend or reduce logging practices that destroy elephant habitats. Yet rampant logging continues, as demonstrated by the 2017 seizure of more than two dozen trucks of illegally logged timber that was owned by the wife of a prominent southern governor. A second strategy that should be implemented is to accompany new transport infrastructures with new conservation corridors. Conservation corridors enable the safe movement and migration of elephant populations and other species by establishing pathways for wildlife to traverse habitats that have been fragmented by infrastructure corridors. Ideally, these corridors should be established both domestically and transnationally. For a successful example of a domestic corridor Laos need look no further than neighboring Thailand’s Highway 304 Wildlife Corridor for Indochinese Tigers. Third, as transnational infrastructures and the movement of goods and people increase across China and mainland Southeast Asia, there is a need for greater bilateral and multilateral environmental conservation initiatives. To date, multistate environmental cooperation within the region has largely been limited to Mekong-Lancang riverine dialogue – and even here there has been little success in preventing highly environmentally deleterious projects. Elephant habitats and populations transcend national borders, and so too must initiatives to ensure the care and protection of the species. At the local scale, successful future elephant conservation will also require the provision of alternative livelihoods for mahouts. Captive elephants in Laos have traditionally been used as draught animals in the logging industry. However, over the last 20 years, the intensification of elephant workloads has affected the fecundity of the population, as the long gestation and lactation period for females has led the majority of mahouts to avoid elephant breeding – which would result in a loss of income for nearly three years. In recognizing this challenge, as well as the physical strain that logging places on elephants, it is now illegal to use elephants for logging. However, while this may enable increased breeding in the future, in the short term the result has been a large number of unemployed mahouts who have sought to sell their elephants – often to buyers who have smuggled them out of the country. Lack of work for mahouts has also seen many domesticated elephants left to die in the forest, so that their body parts can be harvested and sold. In order to prevent the further loss of elephants through such sales, viable alternative incomes must be provided. Tourism has an important role to play here, but must also be carefully regulated in order to ensure that elephants are not mistreated. 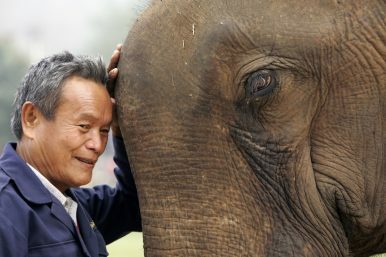 Finally, if Laos’ elephant population is to survive the advancing threats of the BRI and other connectivity schemes it is crucial that successful breeding programs are established. At present, the number of new elephant births in Laos is lower than the number of elephants that are being lost through natural and unnatural causes. It is this downward trend that leads to the current projection of complete species eradication in the country by 2030. Because elephant pregnancies last between 18-22 months and are followed by three to four years of breastfeeding, the period between live births is four to five years. On top of this, only a small percentage of the current female population is capable of breeding due to reproductive health issues. One organization that is attempting to establish a breeding program is the Elephant Conservation Center (ECC), which currently holds 29 elephants: 12 owned by the center, 12 by the Lao government, and four rented for breeding purposes. Through a partnership with the Smithsonian Institute, the ECC has established a successful breeding program and a fully functional endocrinology laboratory. Looking to the future, the ECC also hopes to release captive-bred elephants into the almost 200,000 hectares (494,210 acres) Nam Pouy National Protected Area (NPA). By working in partner with the Lao government, the ECC breeding program seeks to (re)create sustainable breeding populations in the wild. The work of the ECC and a small number of other committed individuals offers some hope for the future survival of Laos’ largest, and most historically significant, mammal. But the future is anything but certain. Elephants are dying and disappearing at a faster rate than they are being born, and numbers are steadily declining. With the profound changes that we can expect to see in coming years through China’s BRI, the possibility that the land of a million elephants will soon become the land of zero elephants is very real. Dr Kearrin Sims is a lecturer in Development Studies at James Cook University, Australia. He has written a number of media pieces, book chapters and academic articles on development issues in Laos and China’s growing presence in Laos and Southeast Asia. Chrisantha Pinto is a biologist at the Elephant Conservation Center, Xayaboury Province, Laos.